Proudly Presented by the Hellenic Institute of Holography and its chief holographer Andreas Sarakinos. 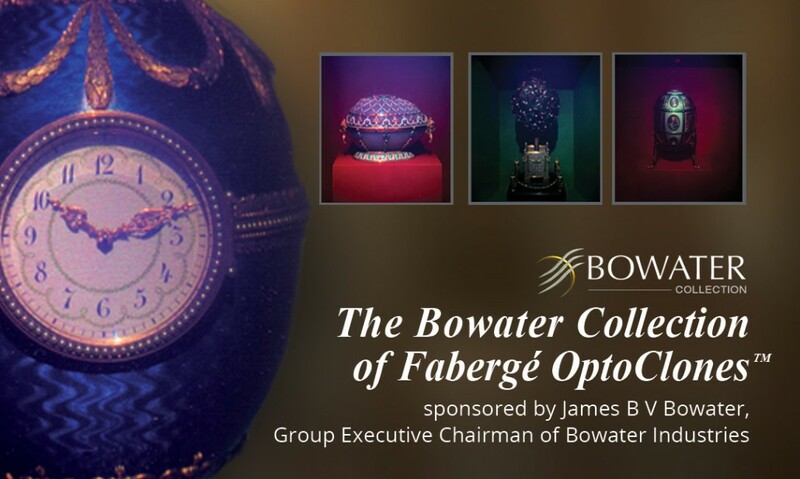 The Fabergé Imperial Eggs have long been the ‘holy grail’ of display holography, ever since the early days of monochromatic holograms of Soviet treasures made their first appearance during the 80s. To the extent that -when colour holography was introduced in 1992- a dedicated holographic lab was set up inside the Moscow Kremlin museums for this purpose, though with little success. Ten years later, the ‘diamonds’ of the Imperial Russian cultural heritage have returned to their homeland as a result of an acquisition by the Russian Foundation ‘Link of Times’ and the first major private museum in Russia was prepared in St. Petersburg for their public exhibition. Since November 2013, when the Fabergé Museum of St. Petersburg opened its doors, thousands of people have already admired the excellence in craftsmanship of the most famous of Russian jewelers of the end of 19th century whilst the Museum is gradually positioning itself as the center of reference for international collectors of the Carl Fabergé legacy. As the 10th International Symposium of Display Holography – dedicated to the memory of Russian scientist Yuri Denisyuk, inventor of the technique known by his name – was coming to St. Petersburg in the summer of 2015, International Year of Light for UNESCO, it was felt that maybe the time was also finally ripe for a dream of holographers to come true: to capture these exquisite objects in holography. And what better on-site use for the newly developed and already proved-in-action ‘ZZZyclops’ laser camera of the Hellenic Institute of Holography… The match-making introduction to the project and the logistics support of the local University ITMO of St. Petersburg made the difference and the financial support of James Bowater of Bowater Holographics (UK) allowed the creation of the first ever collection of 13 Fabergé OptoClones™ featuring some of the most famous luxury art objects. A complicated task in itself, made even more complex by geographical dispersion and unforeseen practical considerations calling for their improvised solution, it all turned into an unforgettable adventure at all stages: from being granted the exclusive use of holographic plates produced by Colour Holographic (UK) and bringing them into Russia to the large number of selected objects and individual respective setups, which ended up in a total of approx. 200 exposures during several sessions extending over a period of more than 2 months. But the project would still be incomplete if a new purpose-built special model of the HoLoFoS™ illuminants were not developed by the Hellenic Institute of Holography. Such special lighting was further incorporated into luxury custom-made free-standing dedicated display systems commissioned by ITMO University for the inaugural public exhibition of this unique collection of ultra-realistic holographic OptoClones™. As unique as the original objects !